Devastating fungi are killing Hawaii’s iconic ʻŌhiʻa trees. 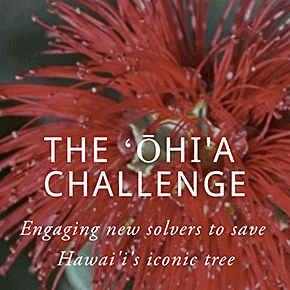 Are you ready to invent a way to help us detect and address Rapid ʻŌhiʻa Death? Think you’ve got a good idea or potential solution? You could win up to $70,000 for your solution! The Challenge is to create low-cost solutions to detect (and predict) the invasion pathways and the spread of the fungus in the environment, as well as solutions that would help contain or reduce the spread without harming other beneficial species. This is an urgent and critical problem that needs attention now: The invasive fungal pathogens are threatening the ʻŌhiʻa tree with extinction. If the tree is lost, there will be devastating cultural and ecological repercussions. We are working on a short timeframe to solve the problem of Rapid ʻŌhiʻa Death. This competition encourages a portfolio of ideas to address the stated challenge. However, Judges may give higher scores to innovations with a faster development and deployment timeline (e.g. turn-key tools able to deploy in the field within 2 years or sooner).